Two UTSC astrophysicists have developed a powerful tool that can calculate the motions of planets faster and much more accurately than ever before. 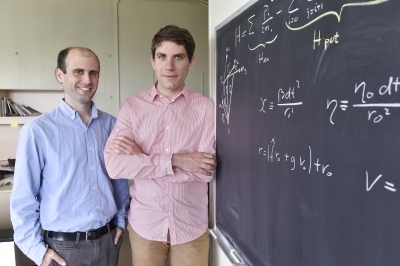 Using a combination of mathematical principles and computer science, assistant professor Hanno Rein and postdoctoral fellow Daniel Tamayo have improved on a powerful class of algorithms called symplectic integrators that have been used to calculate the motions of objects in space over the past 30 years. Rein and Tamayo significantly improved on previous algorithms in two ways; first by speeding it up by a factor of two to five, and also by significantly reducing the accumulation of errors. “Making it faster was crucial because it’s a sequential algorithm, which means this kind of simulation cannot be made faster by using a bigger computer alone,” says Rein. With previous algorithms, small errors would grow by a factor of 100 going from one year to 100 years. The integrator developed by Rein and Tamayo will only grow errors by a factor of 10 over the same period of time. “We can say that we’ve achieved a fundamental limit where we have the most accurate algorithm possible using present day computer processors,” adds Rein. The pair, who conduct research at the Centre for Planetary Science at UTSC, plan to use it to answer one important question; to see if the solar system chaotic or not. “The solar system is very likely chaotic and there’s a reasonable chance that Mercury will get ejected from it or collide with the sun or another planet,” says Tamayo.